In this white paper, we’ll walk through five important things to consider when choosing a key management system as well as benefits and considerations for the 3 main types of auto dealer key management systems. The AirFinder Real Time Location System (RTLS) technology is used in a variety of industries, from healthcare to logistics, but one of the most successful uses of the technology is to keep track of keys and vehicles at auto dealerships and auction facilities. RTLS key tracking has saved thousands of dollars in lost keys, lost time, and lost customers. High replacement cost. A new set of keys for pretty much any new car today runs $200-700 each. Time needed for replacement. Because new keys have to be ordered from the manufacturer in most cases, it can take 1-2 weeks to receive a new key. Unable to sell a vehicle. Imagine finding the perfect car, only to find out that you can’t take a test drive because they can’t find the key. You aren’t likely to stick around to try out your second choice after that experience. Unhappy customers. Service or sales customers who are faced with a car that can’t been driven home because of a lost key aren’t likely to return. Theft. Unfortunately, a missing key could be an indicator of an impending vehicle thief. But even with these critical benefits, nearly 95% of car dealers don’t use and don’t plan to use an RTLS system for key tracking. Therefore dealers that invest in this type of technology have a cost and service advantage. 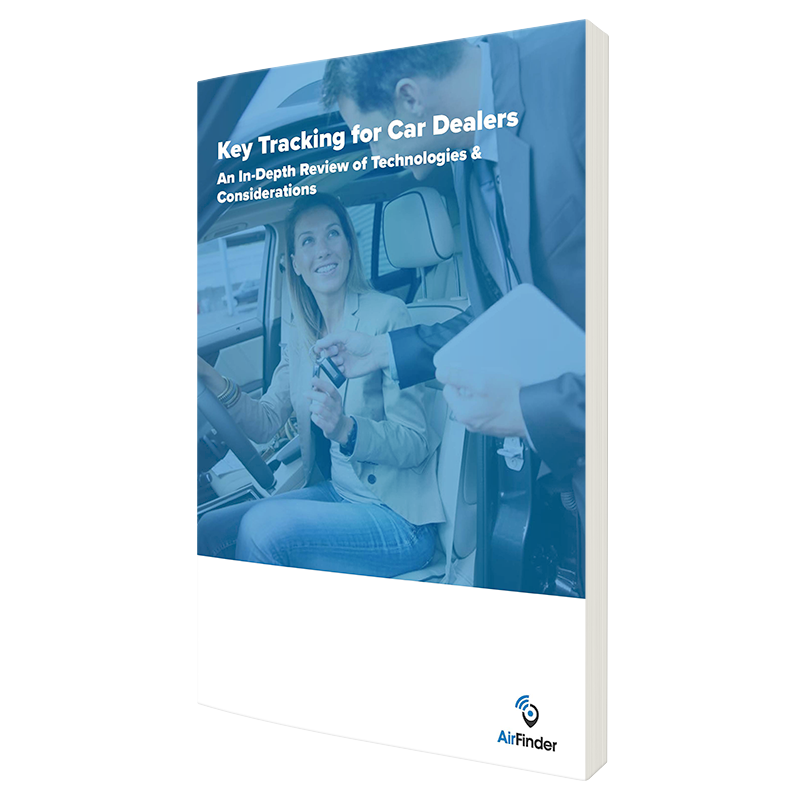 In this white paper, we’ll walk through five important things to consider when choosing a key management system as well as benefits and considerations for the 3 main types of auto dealer key management systems. We’ll also take an in-depth look at why AirFinder may be a good solution to integrate at your facility. 1. Can you find missing keys? Know Location. Most systems only provide an audit log of who checked out a key and when, but they don’t solve the problem of missing keys. AirFinder can be used in conjunction with key management platforms so that even after keys are checked out, they can be found. Get alerts when keys are left in vehicles. Keys left inside of vehicles or that fall out of pockets inside of vehicles are the most difficult to locate. By receiving alerts about keys that are present in the lot for more than a short amount of time, you can quickly recover the keys before too much time passes to remember which vehicle they may have been left inside. Service Customer’s Worst Nightmare. Have you ever lost serious productivity in the shop because the whole team had to systematically search the whole bay to find one set of keys that went missing? Or worse, have you had to keep a customer vehicle while you paid to have a new key made? With AirFinder, you can track down missing keys without the customer even knowing. 2. Can you instantly identify misplaced keys? Misplaced key alerts. AirFinder allows you to perform an inventory check with a click on the mobile app or webpage. Keys that are out of place are instantly identified. Don’t miss sales opportunities. If you are unable to quickly get a potential buyer behind the wheel, you can miss out on a sale. Even if a key is not stored correctly, you can track it down in seconds, so that the test drive can happen. 3. Can you receive alerts when keys are moved during off hours? Unfortunately, theft or abuse can occur when staff have easy access to keys. The first indicator of such a problem is missing keys during off hours, or keys that are moving around the dealership off hours. Set alerts to come via text message or email whenever a key movement pattern does not match your operational expectations. 4. Works with any existing management system. Managing is not tracking, and AirFinder tracking tags can be used with any existing key management system, like KeyTrak. Even pegboard and lock boxes can benefit from having a tracking system. In our experience, the audit trail of key checkouts only deters abuse, but does not prevent keys from being accidently misplaced. Dealers have times when things are insanely busy, and mistakes happen. Being able to open up a mobile app to quickly find a missing key can be the difference between closing a deal and losing it. 5. Can you track other business assets? Once an AirFinder system is installed, it can be used at the dealer to track cars, supplies, parts, and even people. Many dealers discover the added benefits of locating key supplies or personnel quickly. Popular key management solutions like KeyTrak or KeyBank offer an automated lockbox solution which issue keys to staff members identified via fingerprint or ID bag. Some systems even take a photo of the person issuing the key. Works with AirFinder. Key tracking is a separate process from key management. Even managed keys can be tracked when outside of the lock box. Audit trail. Know who checked out which key and when. Instant Inventory. Get an instant report of which keys are missing. Keys can be stolen through replacement or swapping keys. You don’t know where keys not in the lockbox are. Doesn’t work well for service customer keys. Several popular key tracking applications have come to market in the last few years which offer consumers the ability to track and find keys with their smartphone. You can make keys beep to help locate them even more quickly. Other people’s phone can find keys outside of the dealership. Not designed for business use, since one account would have to be shared. Doesn’t show actual location, but the approximate one. The “pin” of location would easily cover the whole dealership. Tags need to be replaced once per year. Active RTLS uses battery-powered sensors that connect to various access points throughout the facility and transfer data to the cloud. These solutions use Bluetooth Low Energy (BLE) technology to reduce system and operational costs and enable asset tracking in emerging healthcare areas that previously hadn’t been able to track assets. There’s no IT integration (depending on the solution). This is the least expensive RTLS option. You don’t have to cover the facility. You can start in one area, or with one function, and create value before scaling. This “crawl, walk, run” approach with testing and deploying isn’t available with most integrative RTLS solutions. Location accuracy of active RFID is only as granular as the number of readers you have, so many readers are necessary for a high level of accuracy. The system can be deployed with no IT integration whatsoever. Many RTLS solutions require complex IT integrations, which can slow down deployment or halt it altogether. However, AirFinder can be installed without touching your IT network, which means a deployment can be piloted very quickly. It is highly secure. Depending on what solution you choose, there are security concerns. AirFinder connects to the cloud through a central Symphony Link access point and can be deployed without ever touching your network. But not all Bluetooth-based active RFID technologies have this upside. You can use inexpensive, open source, flexible tags. AirFinder uses open-source Bluetooth tags that can be purchased from multiple suppliers. This means you aren’t stuck with proprietary (and expensive) one size-fits-all tags. Beacons are sold in hundreds of form factors, which makes application customization simple. This means you can track virtually anything without the bulk of a basic, standard-size tag. Track assets by room or location in real time. Group iBeacon tags together so you can visualize where the group of things you care about are. Create custom alerts so you can be made aware if a key or item moves unexpectedly. These alerts can be sent via email or text message. View custom reports showing where assets are and have been, including their full location history. AirFinder is a product division of Link Labs, Inc. Link Labs creates connectivity technology and solutions for enterprise and industrial customers seeking to derive business value from the Internet of Things (IoT).